These free Christmas fonts are perfect for your holiday projects! I love having just the right font for my craft projects, blog images, Project Life cards and any other idea that I dream up that day. It’s a super big pain to have to stop and search for something that looks just right. Have you ever had that happen?? It drives me crazy! 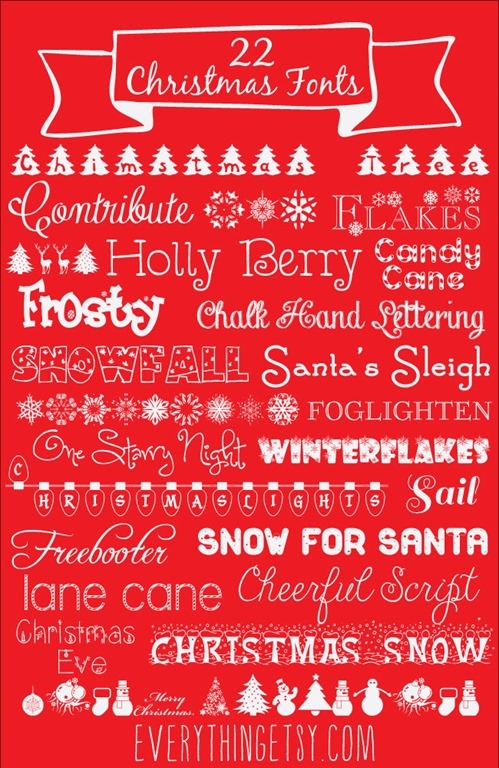 Use these for Christmas cards, banners, gift tags and sooooooo much more! Fun stuff! Check out hundreds and hundreds of handmade gift tutorials right here…gifts for men, easy gifts, gifts for kids and tons more! Thank you so much for the fonts, I lost my christmas fonts when my old computer died and I purchased my new lap top , I really appreciate the links !!! Kim I did not find the link to download the free fonts. Did I miss something? A very nice fond for Christmas! Thanks for it! These look lovely! I like the Christmas tree font!